The phrase in the book, which one can interpret it in many ways. The shortest way is to say that if you are in need of something you have to work for it. But if applied to this book the situation is a little different. 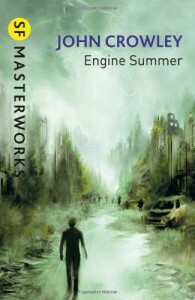 This novel is post-apocalyptic SF written in the second half of the 20th century. D’you get where I’m driving at? Yup, A threat of total self-extermination by nukes. From this perspective many post apocalyptic novels keep the similar lines of plot. Many millions are long dead. Some hundreds or thousands live in semi- separated communities by tens. They interact with each other. This book is no exception. After many are dead some remaining built the place, Little Belaire. Centuries passed. Rush That Speaks wants to know about people that lived in the past. He is a young guy who is unskilled and impulsive. His “mother’s mother” , Mbaba teaches him how to live. His Cord is Palm Cord. A Cord resembles today’s nations or clans. In seeking of the past he knows that Storm had come and brought death to millions. He had learnt about Roads with cars that killed people. Rush That Speaks found that people built ships called planters that went to stars. They gathered a lot of knowledge from distant worlds which they wanted to share it with humans on earth when they’ve returned. But when they came back there was nobody to share with. The only usable things that left after humans are books.